American Yacht Club in Rye, NY proudly hosted its second Leukemia Cup Regatta on Saturday, September 23, in conjunction with the first day of the club’s 2017 Fall Regatta. Nearly 120 boats were listed on the Fall Regatta scratch sheet, with competitors coming from along the East Coast for a two-weekend regatta that has become a staple of IRC, PHRF, and one-design classes such as the J/70, J/88, J/44, J/105, J/109. Race day brought near pristine sailing conditions, with sunshine and oscillating northerly winds. 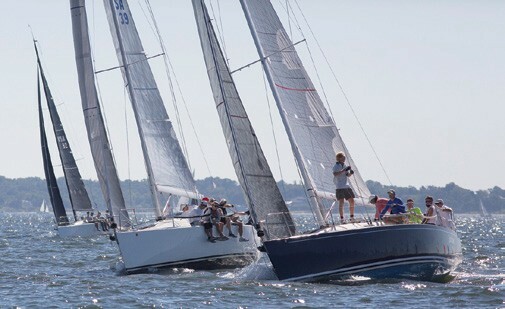 The Leukemia Cup Navigators Course was won by Rich du Moulin’s Express 37 Lora Ann (Larchmont, NY), with Gibb Kane’s Swan 66 Bounty (Rye) second and Corinne & John Forster’s J/92 Saltire (Rye) third. In a beautiful example of how the efforts to restore the Long Island Sound ecosystem are working, sailors were joined by not only a few turtles but also a pod of dolphins. Part of the 2017 event included a stand up paddle regatta on Saturday morning, with more than 40 participants competing on two courses. Prizes included paddling swag, great trophies and of course, bragging rights. The Leukemia Cup Dinner and Auction took place Saturday night. Tickets were sold out, and the clubhouse reached maximum capacity. This was a thrilling day of sailing tied to an incredible cause. American Yacht Club would like to thank Judy & Jim Wilson for their continuous efforts in organizing another successful Leukemia Cup Regatta. 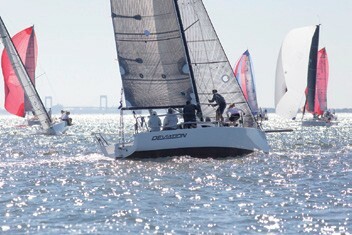 Complete results of the AYC Fall Regatta and Leukemia Cup can be found at YachtScoring.com. Donovan McSorley is the Communications Director at American Yacht Club.